View More In Power Rotary Tool Parts & Accessories - Page 5. 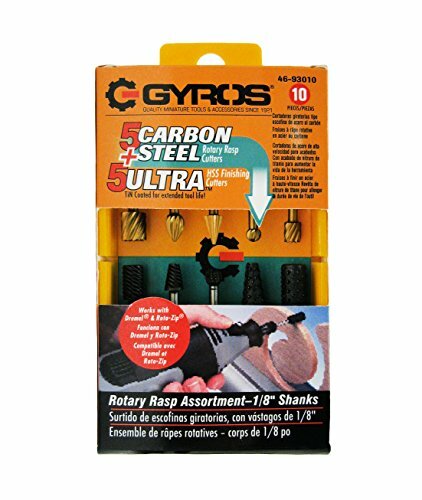 Gyros Rotary Rasp Assortment set is a woodworkers dream. They all have 1/8-Inch shanks-the HSS Cutters are Tin coated for extended tool life. They are used for shaping, hollowing, grooving, slotting, making tapered holes in soft metals, plastics and woods. The Rotary Rasps and Rotary Files are made of carbon steel. They are made exclusively for wood and other soft materials. All cutters have 1/8-Inch shanks to fit * most other rotary tools. Set comes packaged in a handy compact container, perfect for tool box storage. Shapes included in this set: Cylindrical, 5/16-Inch dia. (HSS, Tin coated), Flame, 1/4-Inch dia. (HSS, Tin coated), Cone, 1/4-Inch dia. (HSS, Tin coated), Ball, 3/16-Inch dia. (HSS, Tin coated), Cylindrical, 7/32-Inch dia. (HSS, Tin coated), Rotary File, Tree, 1/4-Inch (carbon steel), Rotary File, Cylindrical, 1/4-Inch (carbon steel), Rotary Rasp, Ball, 1/4-Inch (carbon steel), Rotary Rasp, Tree, 5/16-Inch(carbon steel), Rotary Rasp, Cylindrical, 5/16-Inch (carbon steel). Gyros Cutter Set has a variety of 10 different pieces designed for: woodworking, carving, engraving, drilling, etc.